Popeye, Moscow on the Hudson, Good Morning Vietnam, Dead Poets Society, The Fisher King, Toys, Aladdin, Mrs. Doubtfire, Jumanji, The Birdcage, Good Will Hunting, Fathers Day, Patch Adams, Insomnia, One Hour Photo, Night at the Museum, the list goes on of the excellent films with Robin Williams. One of my favorite scenes is from 1991’s Hook. It invokes our inner child and helps us remember where we came from before growing up got in the way. Why are we creating schisms in marketing and media? Why are we fighting to be the expert and guru in each of these subcategories? If you stop and think about it, what is the difference between digital marketing and social media marketing — vs marketing itself? What are the elements of online media that differ from social media? Take off the end of a hammer and you have a stick. It’s still a tool. Why must we be specialists in sophisticated sticks? If the strategy and audience are the same, then where is the value in creating schisms? If you call yourself a social media expert then I suggest you are a media expert. If you call yourself a digital marketing consultant then I suggest you are a marketing consultant. Stop with the adjectives. Simplify. 1. Write a pithy post. Whatever you write about, keep it short and simple. 2. Skip the title. That’s right. No title. Your dedicated readers will keep reading. 3. Include a link to something epic. If you don’t know what to link to, link to this post. P.S. Cheers to Dave for the idea. Mashable is a one-stop destination for social media news. From platforms to devices and everything in between, Mashable is your place. But because it’s so ubiquitous, people like sharing links to its popular stories. Look at yesterday’s announcement of a new Twitter layout. It’s already been shared nearly 29,000 times. With thousands of people tweeting the same link, your tweet joins the echo chamber. Notice how everyone’s tweet is a little different. Most people maintain Pete Cashmore’s original tweet but some add commentary. They could also add hashtags or tag people. Mashable wants you to tweet what it suggests; but when you do that, your tweet is indistinguishable from anyone else’s tweet. You join the echo chamber. I’ve received flak in recent days for unfollowing people on Twitter. But I do this because they meet the Mashable test. I prefer originality and a challenge to the status quo. 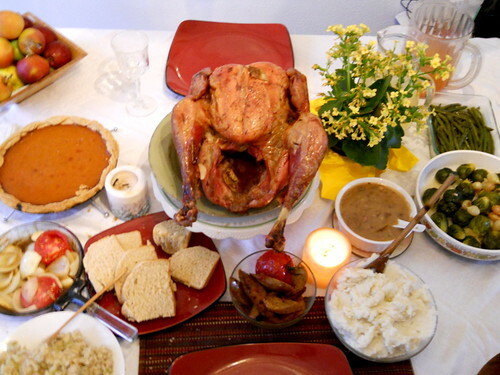 Marking the first harvest by the Pilgrims in 1621, Americans gather every November to celebrate Thanksgiving. We usually carve a turkey and accompany the bird with squash, potatoes, carrots, cranberries, and other foods that the Pilgrims ate. It is a lot of content and it makes us feel content. Look at that word content. In the first instance, the accent is on the first syllable and refers to substance and space. In the second instance, the accent is on the second syllable and refers to gratification and affect. Mass media (and social media particularly) force-feeds us the first instance of content every day. Radio ads, TV shows, newspaper op-eds, blog posts, tweets — this is the content that fills up empty spaces and takes our attention away from the things and people that matter. When we read stories about couples who split as the result of Facebook, we blame the content and never feel content. To my friends who carve into that turkey and eat it, I ask you to chew it and taste it. Don’t merely chew a few times and swallow but truly taste its texture and saltiness. Some say you should chew your food 17 times before swallowing to practice mindfulness and be in the moment. Others suggest chewing up to 50 times to tell your brain that you’re less hungry than you appear. I ask you to be content with less content. Phrased differently, I ask you to be grateful with less stuff. You don’t need to be everywhere all the time. It’s unhealthy. When you sit down at your family Thanksgiving dinner, ensure your cellphone or smartphone is neither beside you nor in a pocket. Keep it away in a jacket or your bedroom or your car. If you’re eating with friends, treasure the time you spend with the people you care about. If you’re eating with strangers, take the time to talk to them and learn their passions. When the dinner ends, don’t reach for that phone to see how many email messages you missed or who shared Vine videos in the interim. Who cares? Is that content truly important? Wouldn’t you rather feel content the way the Pilgrims did?